An author of whom I know nothing whatsoever! She appears to have written just one book. This is a game book akin to the role playing 'fighting fantasy' books where you make choices to decide the outcome of the story. But instead of swords and sorcery it's saddles and stirrups! 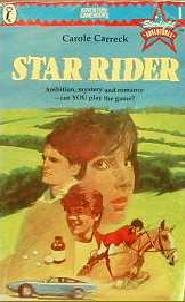 The book was part of a series of such game books aimed at girls called the Starlight Adventures series. I think this was first printed in USA, then possibly in the UK. SUMMARY: An unusual pony role playing game book in which you change the outcome of the story by choosing various options. You take the role of an aspiring equestrienne who is setting out to make her name in the horse world. Suitable for a wide range of ages as the main character is an adult and there are romantic elements to the plot. Worth a look if you are feeling bored and want to try something different. I am not 100% sure of the publishing history of the book. I am fairly sure it was published in the USA, but not certain whether there was a UK edition too. Sadly I no longer have my copy to check! The book is not easy to find in the UK, but fairly easy to get hold of in the USA. 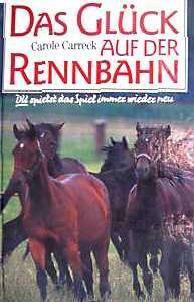 There is also a German language edition which has a much nicer cover than the rather garish one on the British edition.